Ably outperforming Intel's older chipsets, the Toshiba ran all our tests with ease. 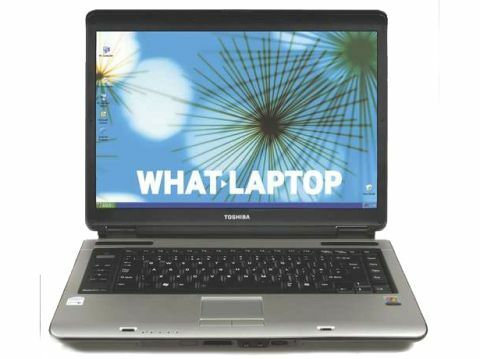 While manufacturers such as Toshiba tend to wait before adopting new technology, the Toshiba Satellite Pro A100 (£1056 inc. VAT) is a notable exception. Well designed, this is currently one of the few Core 2 Duo laptops to show full potential. The unit we saw was a pre-production model, so the final specification may differ, but our review unit came powered by the 2.16GHz Core 2 Duo T7400 chip and performance was impressive. Even with just 1024MB of memory and a 5400rpm hard drive, the Toshiba bettered all rivals. Test results were excellent. Scoring 261 points from MobileMark 2005 tests, performance exceeds previous dual-core chips. Once full software optimisation takes place, this power is sure to increase. The dual-core tests of Cinebench software showed equal aptitude. Ably outperforming Intel's older chipsets, the Toshiba ran all tests with ease. Unlike many comparable laptops with this specification, the Toshiba provides decent mobility. While a battery life of 160 minutes is less than we would hope for from a modern laptop, its 2.9kg weight suits frequent travel use. Measuring 361 x 267 x 41mm, the chassis is strong and can be carried with ease. Multimedia performance takes a back seat. The ATi Mobility Radeon X1400 graphics card comes with 512MB of its own memory and is a mid-level GPU. Better suited to everyday tasks than gaming, it scored a 3DMark score of 4813, which is satisfactory for entry-level games but mainly for multimedia work. Equally, the 15.4-inch screen is aimed at basic use. With a low resolution of 1280 x 800 pixels, there's not much room for multiple windows. However, its Super- TFT coating allows images to shine and brightness is strong enough for both indoor and outdoor use. Aiding business use, the optical drive supports all standard recordable CD and DVD formats. Along with its 100GB Fujitsu hard drive, storage space is comprehensive. Dual-layer discs cannot be recorded to, but this won't hinder the needs of most home and office users. For staying connected on the move, an Intel PRO/Wireless 3945ABG chip provides high-speed wireless access. However, fixed Ethernet connections are slower, with only 10/100 Base-T speeds available. Bluetooth also allows peripherals to be wirelessly synced.